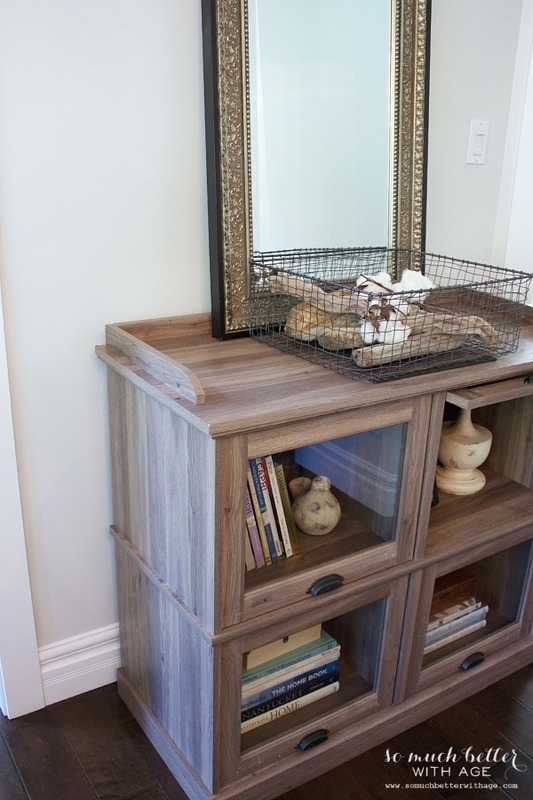 Here is how I took one cabinet and showed its versatility by styling it three different ways. 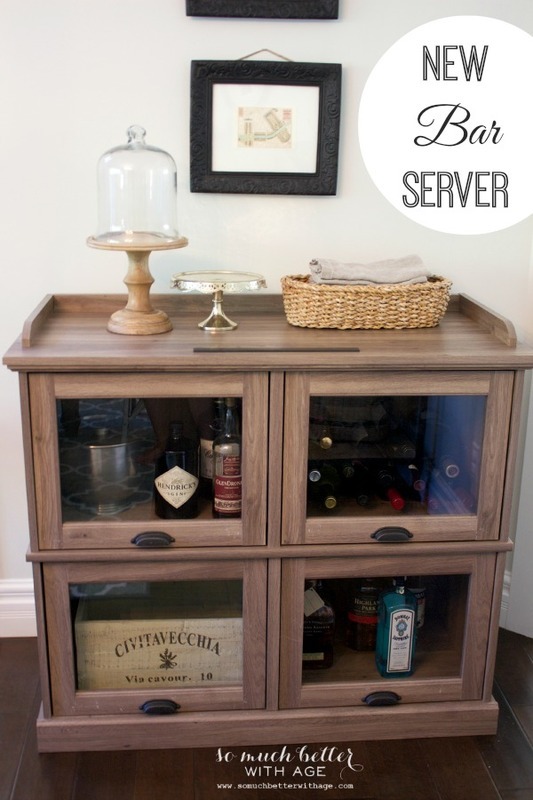 A few months ago I showed you how I styled a TV furniture stand into a bar serving area. I love furniture that can be used for different purposes. That’s what makes furniture investments so worth it. If it doesn’t work for the reason you purchased it, you can change it for a new purpose, just like that! 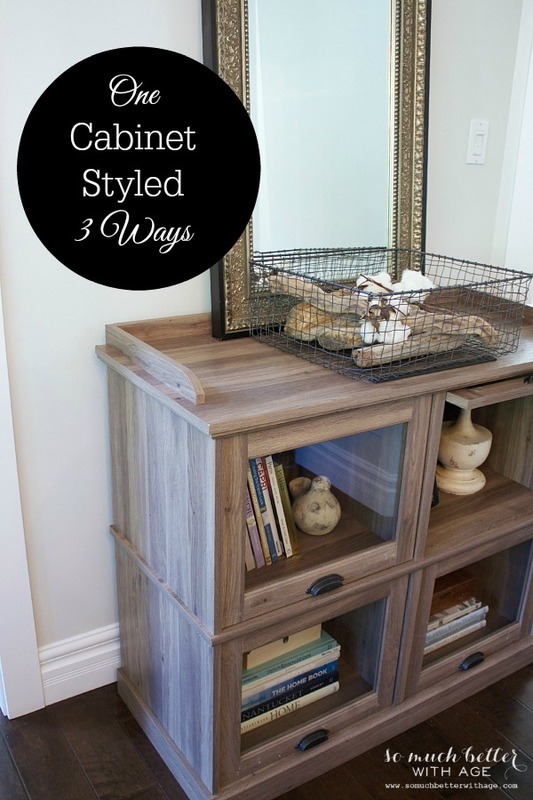 Today I’m showing you how I styled one cabinet three ways (going on four!). This is my bar server, remember? It’s actually a TV stand from Sauder. I love the glass door fronts on it. They make the whole piece unique. For fun, I styled it a few different ways to show you how you could use one piece for different purposes. There isn’t any reason why you should keep a piece of furniture for the way it was intended if you feel it could be more useful in another way. Why not, right? 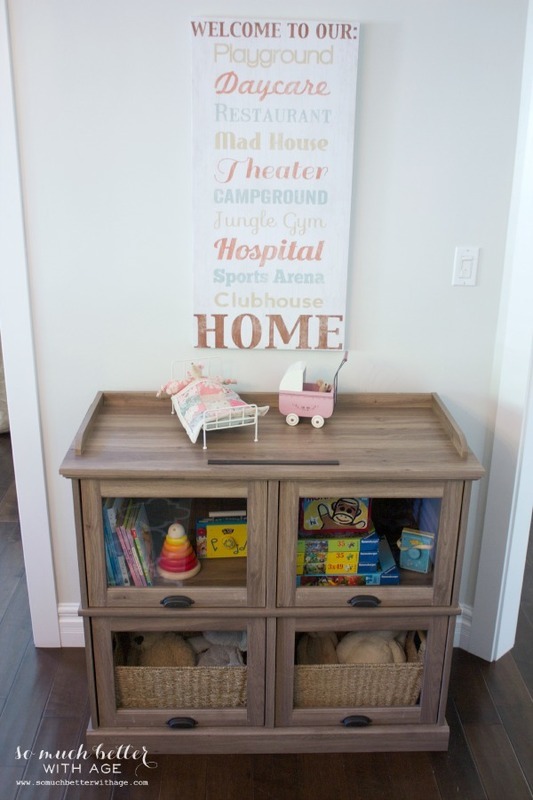 Here is a great way of using it in a play room or bedroom. It keeps the room tidy and toys are still easily seen. I love how the door fronts easily slide back and stay put. Using it this way with home decor items is another favorite of mine. 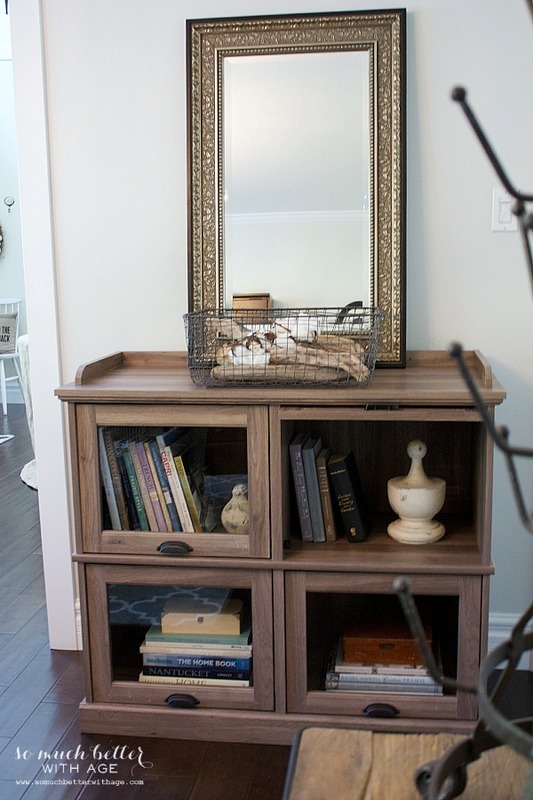 It would look great in a foyer or living room displaying books and a mirror like this. It seems to look good everywhere with anything! And coming up, it’s going to have a new use. We moved it to our rustic cabin in the woods this weekend and will be a beautiful addition to our guest room. 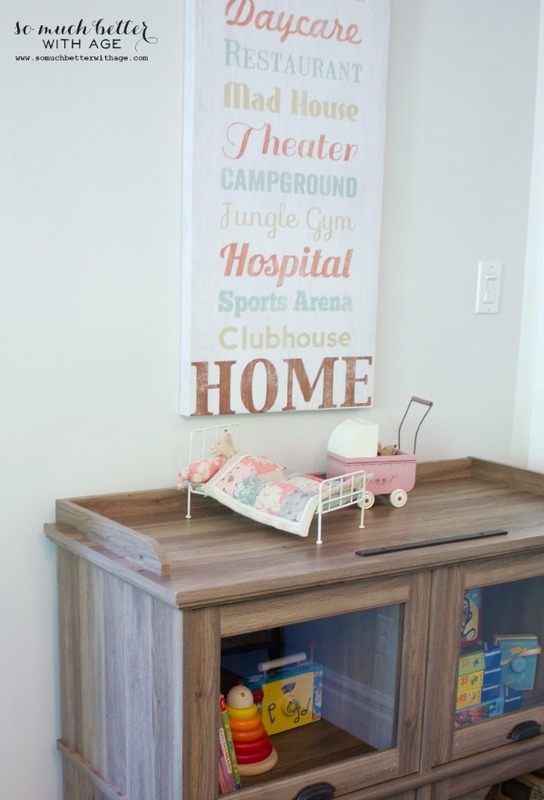 It’s a great way of displaying puzzles and board games as well as beautiful towels that our guests can easily find. When you wait until the end of the post, it makes it seem like you’ve pulled a fast one. Sorry, the first part of my post seems to have disappeared. It should have said, “I appreciate those few bloggers who state at the beginning of a sponsored post that it is, indeed, sponsored. I accepted the opportunity to work with this company because I liked this cabinet. My entire post on how I styled it three different ways was my own idea. How is that pulling a fast one on you? You seemed to like the post or else you wouldn’t have read it? How is she pulling a fast one Riley? So what if the furniture was provided to her? She’s doing a post about styling/using furniture more than one way and yet still disclosed that the post was “sponsored” simply because of the particular piece she used. And Jamie, the post is lovely. Love how you’ve managed to find so many uses for a “TV cabinet”. Just goes to show how a little creative outside of the box thinking can make your furniture go a lot further. I want this!!! 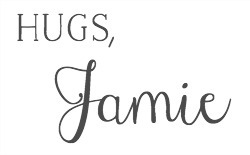 But seriously, Jamie how cool is that? 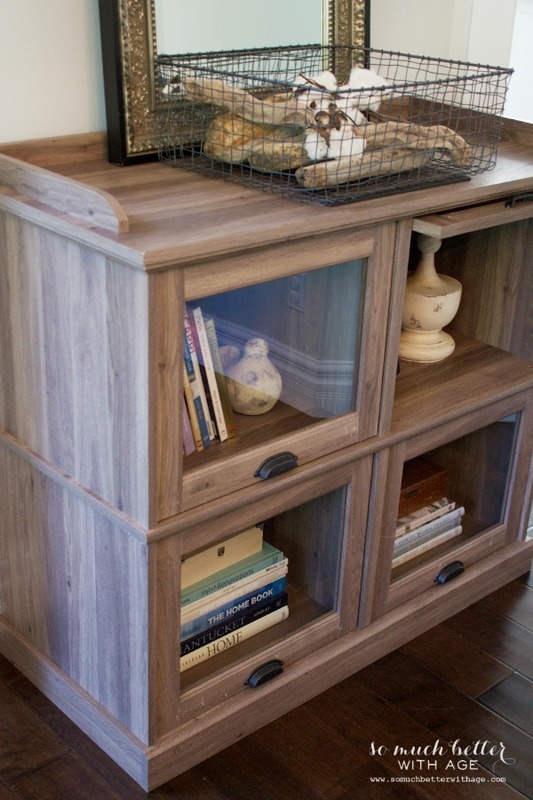 I love that you found multiple ways to use a “tv cabinet” in your home! 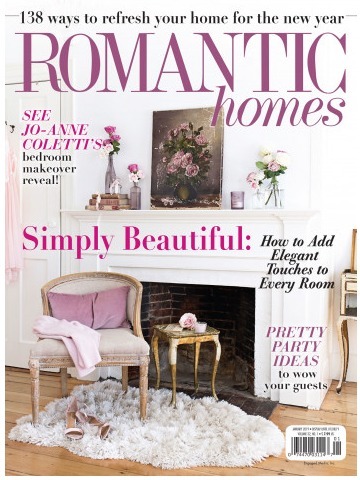 Lovely piece and GORGEOUS styling, as usual!! Has anyone ever read a negative post about a comp’d product? I sure haven’t, which leads me to believe that such a thing does not exist, which in turn leads me to be skeptical of bloggers’ protestations of “my opinions are my own”. Because a sponsored post seems to be nothing more than an advertisement for the comp’d product, I prefer to skip them, and thus my comment about appreciating those bloggers who lead with the “this is a sponsored/comp’d product post”. How is it pulling a fast one? You slipped in a commercial. Judging from your response, my comment must have hit close to home. Honesty and ethics go a long way. I understand your viewpoint, Riley, but my opinions are my own. I did a post on a Mohawk rug awhile back and honestly I wasn’t thrilled about the piping along the edge and I mentioned it but I loved the rug. Before we accept a campaign, we are given details about it and I may ask a friend if she really likes it. I choose not to accept anything that I don’t want in my home. We get TONS of sponsored post opportunities and I pick like maybe 5%. It’s crazy how many are out there and I agree, that some sponsored posts from some bloggers can come off sounding very commercial-y. I think you have to choose which bloggers you would like to follow and which ones you don’t. That’s where your choice comes in to play. If you don’t want to follow me, you don’t have to. Sometimes I put the disclosure at the top and sometimes at the bottom. I try respond to all my comments on my blog but I still have some last week that I haven’t gotten to yet. This must have hit close to home to you since you have left numerous comments on my post today. We are all welcome to our opinions and I appreciate you taking all the time you took to do so. If, as you say, your “opinions are your own” what could it possibly hurt to state that at the beginning of the post? Honestly, I will consider it for future sponsored posts. I never intentionally stick it at the bottom, like I said in my previous response above, sometimes I put it in the beginning and sometimes I stick it at the end. I don’t think it’s about tricking the reader, at least that’s never my intention. For me it’s about trying to even remember to do it at all as it’s usually midnight while I’m editing my post, putting the final touches on it after the kids are in bed. I appreciate your concern in this sponsored post. Just out of curiosity, have you ever published a negative review of a sponsored/comp’d product? I think I answered this in my response above. Beautiful, as always!! 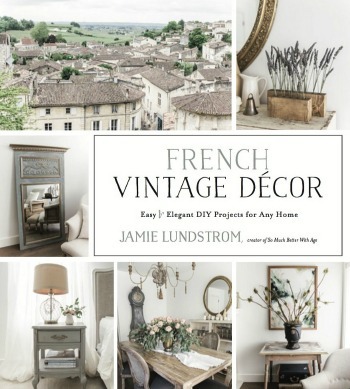 Love seeing so many different ways to style one piece of furniture!! I seriously love this cabinet! And you styled it beautifully, of course! 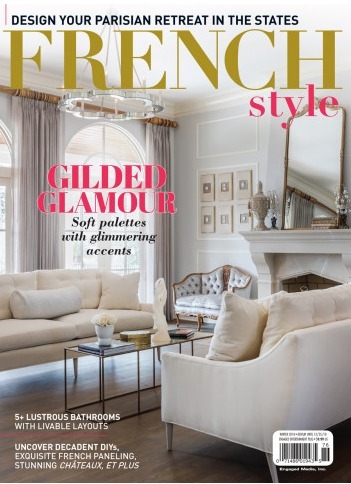 Love this piece and the ideas you came up with for styling it. Can’t wait to see what you do with it in it’s next life at the cabin!